Stir sour cream, 1/4 cup chives, milk, lemon juice, and 1/4 tsp salt in a small bowl until combined - set aside. Add zucchini, green beans, and corn. Cook, stirring until beginning to brown - about 6 to 8 minutes. Reduce heat to low; stir in ricotta, Monterey Jack, the remaining 1/4 cup chives, the remaining 1/2 tsp salt, and pepper. Cook, stirring gently until the cheese is melted - about 1 to 2 minutes. To roll crepes, place one on a piece of parchment or wax paper (or leave it on the piece of plastic separating the crepes in the package). Spoon one-fourth of the vegetable-cheese mixture (about 3/4 cup) down the center of the crepe. Use the paper to help you gently roll the crepe around the filling. Place the crepe seam-side down on a dinner plate. Repeat with the remaining crêpes and filling. Serve each crepe topped with 2 tablespoons of the reserved sauce and more chives, if desired. 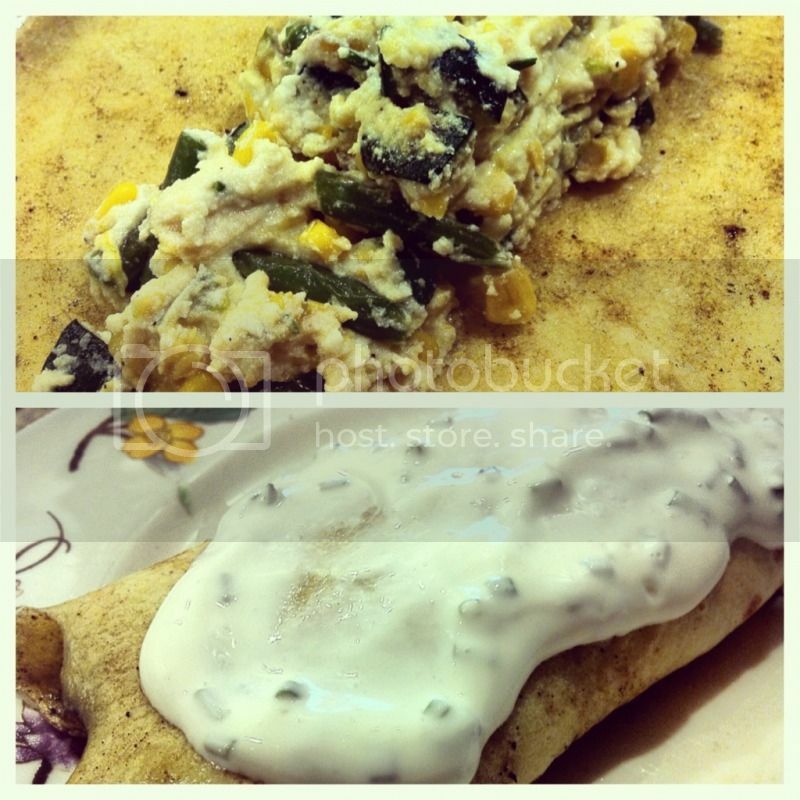 Though it is convenient to use "ready-to-use" crepes, it is also pretty easy to make your own! We use Alton Brown's recipe - he even includes a helpful video. Do note that if you make the crepe yourself the batter will have to sit in the fridge for at least an hour - so, plan ahead.